The South East coast of America boasts some of the very best golf courses in the whole of the USA and offers golfers a tremendous amount of variety as well as outstanding quality both in terms of course condition and level of service. As well as world famous courses such as Pinehurst No. 2, TPC Sawgrass, the Ocean Course at Kiawah and Harbour Town at Hilton Head, there are any number of hidden gems and nationally recognised classics. Indeed our destinations boast at least a dozen of the top 100 places you can play in the US according to Golf Digest Magazine. Myrtle Beach is a fantastic golfing area with over 80 championship courses. Unlike many other resort areas in America golf rates are reasonable even at the top end yet the quality of the courses, variety and level of service is excellent. Courses of note include King’s North, Barefoot Dye, Fazio, Love and Norman, Grande Dunes, Dunes Beach & Golf Club, Tidewater, World Tour, Legends Heathland, Moorland and Parkland, Oyster Bay, Glen Dornoch, Long Bay, River’s Edge, Prestwick, TPC of Myrtle Beach, Heather Glen, Arrowhead, Pine Lakes, Tiger’s Eye to name but a few. Just south of Myrtle Beach in Pawleys Island you will find some of the very best golf in South Carolina including the Mike Stranz designed duo of Caledonia Golf and Fish Club and True Blue, Jack Nicklaus designed Pawleys Plantation, Heritage, Litchfield Country Club, River Club, Founders Club of Pawleys Island, Willbrook and Tradition Club. several other excellent courses close to the city centre. 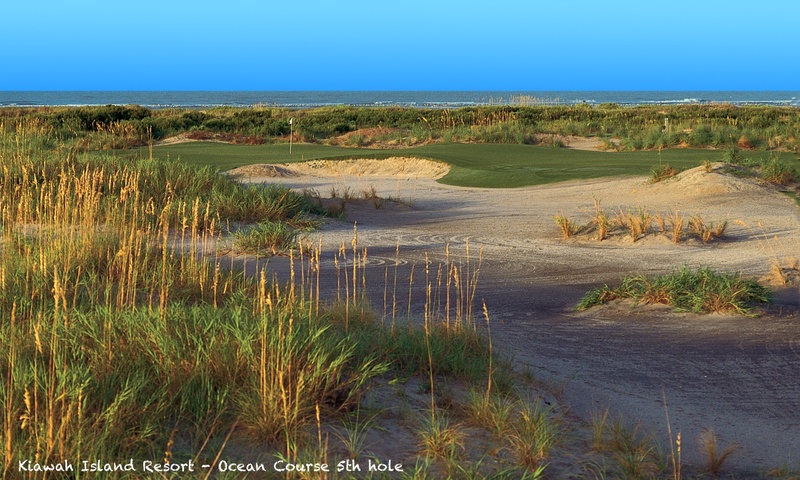 Wild Dunes Resort on Isle of Palms has two fantastic courses, the Links course and Harbor course. In the Mount Pleasant area just north of Charleston you have Charleston National, Patriot’s Point, Dunes West and Rivertowne Country Club which until recently hosted Annika Sorenstam’s tournament on the LPGA. 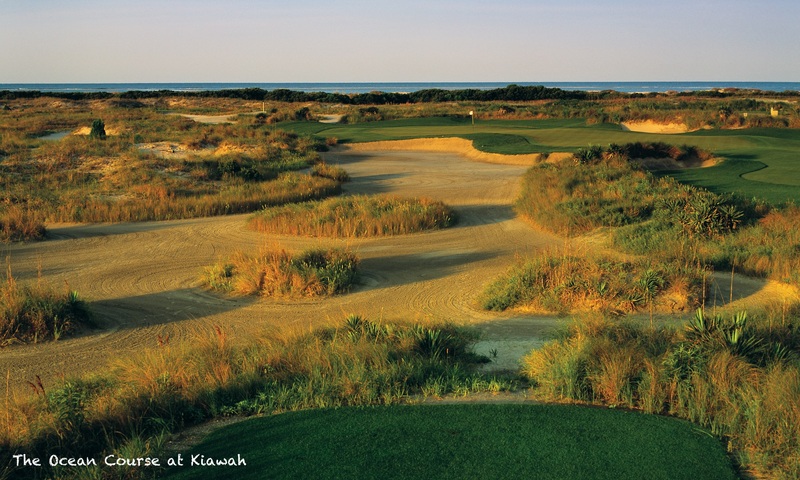 At Kiawah Island Resort just south of Charleston there are four top class golf courses including the wonderful Pete Dye designed Ocean Course, ranked the toughest course in America (you’ve been warned!). The other courses are the Jack Nicklaus designed Turtle Point, Osprey Point by Tom Fazio and Cougar Point which was redesigned by Gary Player in 1996. Off the island is Oak Point designed by Clyde Johnston. Hilton Head Island is a great golf destination. At the southern most point of the island you have Sea Pines Resort, home to the world famous Pete Dye classic Harbour Town Golf Links a regular PGA Tour Stop. There are two more courses in the resort, Heron Point, another develish Pete Dye design and Atlantic Dunes, designed by Davis Love III. In Palmetto Dunes Plantation there are also three outstanding courses by Robert Trent Jones, Arthur Hills and George Fazio. The Heritage group have several courses on the island – Shipyard Plantation (3 nines), Palmetto Hall Hills and Cupp courses, Barony, Planter’s Row and Robber’s Row at Port Royal Plantation and Oyster Reef. Off the island there are several more courses including Crescent Point, Eagle’s Point and Hilton Head National. You can also take a ferry across to Daufuski Island and play the splendidly named Bloody Point Golf Club. The Donald Ross classic Pinehurst No. 2 needs little introduction, host of several US Opens and other major tournaments, but Pinehurst Resort boasts NINE 18 hole championship courses, the ultimate stay and play golf resort. There are many other courses in the area you can play as well including the highly rated Tobacco Road, designed by the late Mike Stranz. At Reynolds Plantation on Lake Oconee there are six fantastic golf courses on site. The Creek Club is private for member play only but there are five courses open to guests staying on-site at the Ritz-Carlton Reynolds. the Landing, The National, The Plantation, The Oconee and Great Waters making it a fantastic stay and play destination. If desert golf is more your thing then Scottsdale, Arizona is the place to go. Famous names like Troon North and TPC Scottsdale, home of the Phoenix Open on the PGA Tour are complemented by many other desert jewels such as Grayhawk, WeKoPa, Boulders, Ak-Chin Southern Dunes, Sunridge Canyon, Rancho Manāna, Legend Trail and Longbow. Or you can head into the mountain foothills and play Quintero or Gold Canyon, or even take a day trip to Sedona. That brings us to Florida. Let’s start with Sawgrass. Who hasn’t watched the Players Championship and wondered what it would be like to the play the famous island green 17th hole? Well here’s your chance. There are two Pete Dye courses on the Marriott Sawgrass Resort, the aforementioned TPC Stadium Course and the Dye Valley course. In addition to the on-site golf there are a number of other excellent area courses which we can provide rates for – Sawgrass Country Club, Palencia Country Club, Marsh Landing Country Club and Ponte Vedra Country Club, basically a lot of country clubs! In nearby St. Augustine there is The World Golf Village which has two courses, King & Bear and Slammer & Squire. We also feature two more PGA Tour venues. Choose from five 18 hole championship courses at the PGA National in Palm Beach Gardens. There are also four courses at Innisbrook Resort near Tampa including the well respected Copperhead Course. Reunion Resort near Orlando is the only golf resort in the US that features courses designed by Jack Nicklaus, Arnold Palmer and Tom Watson. Apart from our featured destinations we work with a number of reliable industry partners to bring you many more golf destinations so please do not hesitate to ask us if you want to play golf elsewhere in the USA.